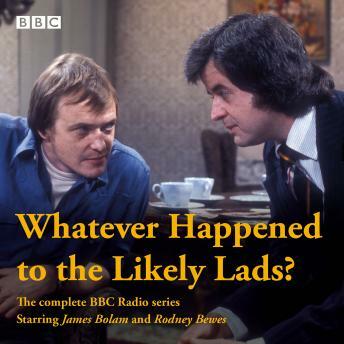 One of the most popular TV comedies of the Seventies, Whatever Happened to the Likely Lads? won a best sitcom BAFTA and attracted an audience of millions before being adapted for radio. Originally lost from the BBC archive, the audio for many of these episodes was recovered by producer Stan Was, the BBC's Archive Treasure Hunt, and a listener to BBC7. The episodes included are Strangers on a Train, Home is the Hero, Cold Feet, Moving On, I'll Never Forget Whatshername, Birthday Boy, No Hiding Place, Guess Who's Coming to Dinner?, Storm in a Tea Chest, The Old Magic, Count Down, Boys' Night In and End of an Era.